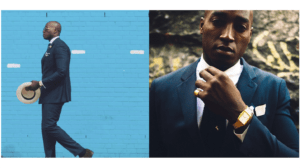 Equal parts safe and eye-catching, playful and versatile, a bold blue suit can invigorate your sartorial personality and renew life within your wardrobe. 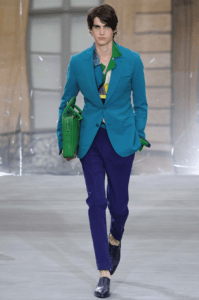 Take in the colour usage, intricacy, and detailing of both Canali’s and Brioni’s Spring 2016 collections. 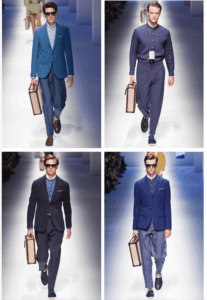 Brioni’s two-button notched wool suits sported various shades of blue. Belts were layered over the tailored jackets to cinch the waist. 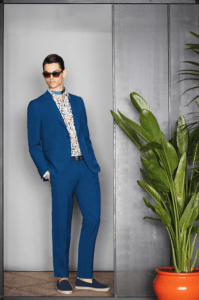 Take a look at the collection here Brioni Spring 2016 – we think you’ll be inspired. Canali’s silk organza suits blurred masculine and feminine boundaries. 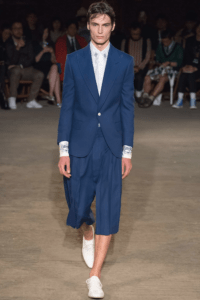 The lean tailored suits paid homage to the 1950s using precious blue colours. The adaptability of separate suit pieces makes it suitable for customizing and styling. 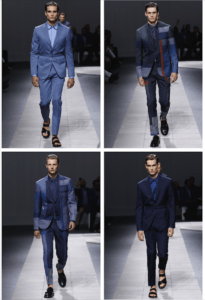 Link to full collection here – Canali Spring 2016. With its diversity in material, colour combinations, and accessories, styling a blue suit can be casual, corporate, modern, or formal. Different shades of blue with spring and summer palettes can easily create a range of looks taking one from day to night. The beauty of a blue suit is its versatility between seasons and occasions. 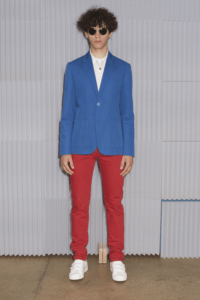 We have seen blue suits paired with the brightest of colours; embracing the athleisure aesthetic when paired with sneakers; weekend-casual with a pair of jeans; and artistry in the hand-painted blocks and stripes of opaque shades of blues, as seen in Brioni’s Spring 2016 menswear runway. “There is not one blue. There is only one black, and there are variations of greys. But, there is a spectrum of blue that allow for a lot of play”, says Andrew. “There is room for experimentation, when before, these [colourful garments] were only niche items”. Understand what fit and shape suits you. Explore materials, textures, colour ranges. Less can be more when accessorizing; work well with your colours and play with textures to amp up an outfit. As the summer rolls by, fabrics become important to think about. Jason recommends finding a suit with Super 120 wool due to its quality (A suit’s S number refers to the fineness of the wool fibers used in the making. The higher numbers translate to narrower fibers, which makers say are softer to the touch). A fresco wool, (fresco is the Italian word meaning fresh) is designed with an open weave to achieve a lightweight, yet structured result. 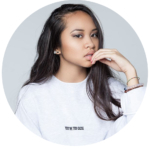 Linen: Breathable and dependable, linen is a go-to classic and perfectly ‘suited’ for casual wear like a vacation in Capri or other relaxed events. Look for a cotton or silk blend to help avoid wrinkles. Seersucker, a thin, puckered and all-cotton fabric is also ideal. Commonly worn in the Southern United States, Seersucker is considered to be quintessentially American.